Choosing the ideal luggage can be really difficult. There are so many different options out there at the moment, so it can take a really long time to figure out what the best option for you is. 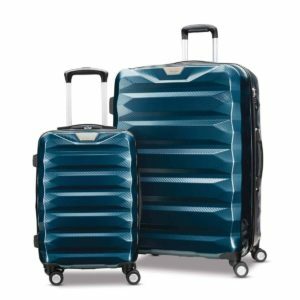 We tested and reviewed this Samsonite hardside luggage to give you a better idea of what to expect from this one and to help you to decide if this is the luggage option for you. Samsonite have actually been manufacturing suitcases since 1910, so it is safe to say that they really know what it takes to produce high quality luggage options. Please read on below to see our review. Samsonite is a very well-known brand in the luggage industry, so we were definitely expecting good things from this particular luggage set. The set that we tested out has a large case for checked luggage and a smaller case that can be used as a carry on. What we loved about the carry on case is how spacious it is. There is more than enough room to carry all of your essentials. Made from 100% polycarbonate, one of the things that really impressed us with these cases is just how lightweight they are. They remained lightweight even after being fully packed which is great. The hard shell provided more than adequate protection, which as we know is important considering how much the case is going to be thrown around during transit. 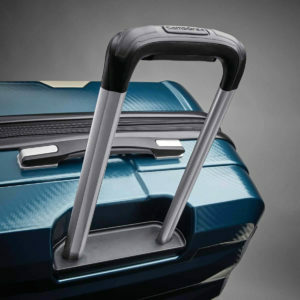 One of the best things about this Samsonite hardside luggage is the fine details on the inside of the case. The silky material on the inside is fantastic, not only in terms of appearance but also functionality; it protects your belongings really well. The design on the outside of the case is actually quite unique; it has an original shape and is finished in a stylish metallic colour. Another thing that we loved about this suitcase was the dual spinning wheels. We found that this made moving the case so much easier and we had no trouble moving around corners or in tight spots. The three stage pull handle worked perfectly and is very comfortable in the hand. In terms of capacity, this suitcase is great. We were easily able to fit enough in there for two weeks without having to struggle in the slightest. The suitcase also comes with TSA approved locks which is another great feature. All in all, we highly recommend this case. It is highly functional, brilliantly designed and does just what it should. The only downside is that it is a little on the expensive side, but this really is a case of getting what you pay for.